THE RESISTANCE SERIES — Two award-winning novels celebrate those who dare to buck the system... set in the resistance movements of the 1960s and '70s. Today, as the planet spins right instead of left, the spirit of resistance rises to buck another dark power. 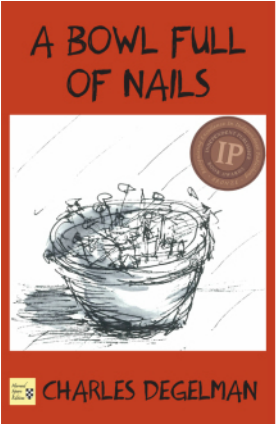 Maybe it's time for a sequel to A Bowl Full of Nails and Gates of Eden... But in the meantime, here are two stories that I hope reflect the spirit of resistance past and present. To write A Bowl Full of Nails, I drew upon my own life as a political theater worker, antiwar activist, carpenter, communard, and counterculture gypsy. In doing so, I found myself also exploring the intricate and oft-confusing dance that can unfold between the political and the personal. BERKELEY, CALIFORNIA, May 15, 1969 — Fiery young Gus Bessemer vows to stop the war in Vietnam. His weapon of choice? Guerrilla street theater. But when a Berkeley riot squad escalates from teargas to shotguns, Gus’ defiant art attack screeches to a halt. Injured, outraged, and on the lam — Gus splits for the Colorado Rockies to work with his hands and get his head together. Ironically, Gus’ quest for inner peace brings him face-to-face with a Rocky Mountain counterculture full of outcasts, rebels, FBI snitches, stolen dynamite, and a dead body in the National Forest. I wrote Gates of Eden because I have seen how the antiwar movement and its '60s history has been rewritten. I wanted to set the record straight. I also was itching to bring Gates' colorful characters to life, and to reflect on my own participation in this complex, tumultuous, and earth-shaking time. After I had listened to one Generation Xer after another tell me we had just smoked dope and gotten laid in the 60s, I had to create another, more authentic narrative. I’m a writer, so I told the story of our revolution… like it was. The result? Gates of Eden, a tale of resistance, rebellion, and yes… love. Gates of Eden follows a handful of young rebels as they band together to create the most powerful antiwar movement in history. From their scattered beginnings through a surge to resistance, Gates’ colorful characters invite us to join them as they transform “hell no, we won’t go,” into a celebration of collective action, shared consciousness, sexual revolution, and the realization of their dreams. I write short-short stories for this unique literary site. These stories draw on my own experiences and reflections, but who knows where memoir ends and fiction begins? Given present circumstances, the tales below might remind us that we never stopped resisting. Mas o menos, we've been here before, done that, ready to do it again. "Midnight Shift at the Bulletin"
"Stanley Mouse & the Little White Pill"
I wrote this story as part of a collection of impressions I gathered during a Cuban – American writers conference held in Havana. It was my second trip to Cuba, the first being a journey with Indecent Exposure, a theater company. Cuba can be confusing to Americans. The 60-year, U.S.-imposed blockade, el bloqueo as the Cubans call it, has created an illusory curtain of romance, suspicion, and myth about the island, its people, its government and culture. Americans have funny impressions of Che and Fidel, Cuban cigars, rum... and its vintage American cars. I wanted to massage a modicum of reality into the oft-repeated romantic notions Americans have of Cuba and I chose its resurrected American autos as... yes, my vehicle for doing so.